Welcome to Ayana Jewellery’s “Jewellery Care Guide”: To keep your handmade jewellery looking its very best, clean with a polishing cloth after every wear and store in a cool, dry place when not worn. All Ayana Jewellery orders come with a polishing cloth to make keeping your jewellery sparkly easy! Below explains why your jewellery goes dull, or darker and some easy ways to prevent this and keep your jewels at their best. Sterling silver 925 is made up of 92.5% fine silver – fine silver is a very soft metal. (Jewellery generally can’t be made from this as it scratches easily and won’t hold its shine). The other 7.5% is made up of other metals (typically copper) which when mixed together with fine silver make “sterling silver“ . This composite and process strengthens and stabilises the metal which makes it perfect for jewellery making and for creating jewellery which will last a lifetime. The downside of this is that, these other metals in the composite cause the silver to darken over time. We know this as “tarnishing”. While some pieces will look great with this aged effect, sometimes you want your piece to sparkle on. Rose gold is made from a gold and copper alloy. Copper has a strong pink-orange colour so by adding this to gold it gives the gold a pink tint. For our Luxe Range we handcraft the jewellery in Sterling Silver, then have it plated in Rose Gold. The rose gold used is a 14k Italian Rose Gold which has a lovely soft pink tone. Rose Gold just like Sterling Silver has the downside that copper is added to the gold to make this “rosey” hue. This means, it tarnishes in a similar way to Sterling Silver. Due to the metal being plated, you have to be careful when cleaning the jewellery. It is best to clean the jewellery lightly every time you wear it with a polishing cloth and follow the care instructions included with your jewellery. 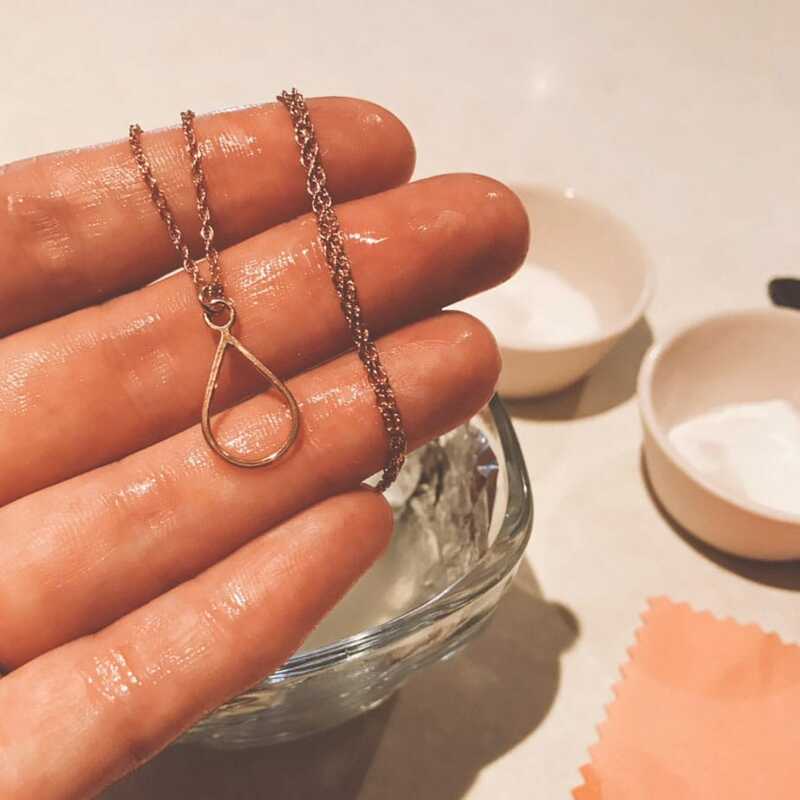 You can also use the recipe below to bring the shine back to your Rose Gold Plated Jewellery, but we only recommend doing this every few months as it may cause the plating to come off faster. We can however get your jewellery plated again for a small fee. Please Contact Us to discuss. This is a simple recipe you can make at home with ingredients in your cupboard to bring your silver jewellery back to life! If you would like us to polish the jewellery back to life for you, we can do this for a small fee. Please Contact Us!